Back in June, Tinder announced that it was testing Tinder Gold, a premium feature that let you see which other users had swiped right on your profile. It’s now rolling out worldwide and will set you back by $5 a month on top of your Tinder Plus subscription. That’s an interesting addition to the list of paid features Tinder already offers, including a Boost that surfaces your profile up to 60 percent more frequently for a limited time, and the ability to Super Like (which notifies a user that you’ve liked them, even before they swipe right on your profile). 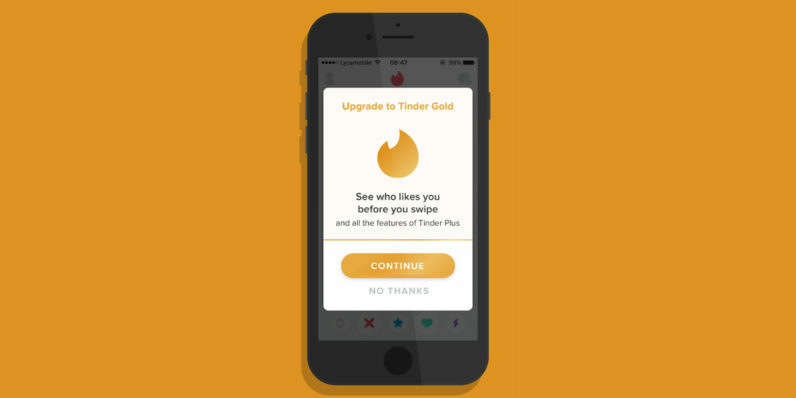 Based on our resident Dutch heartbreaker social media manager’s research, it looks like Tinder Gold isn’t retroactive, and reveals which users have liked you from the time you turn on the ‘Likes You’ feature by paying for it. Tinder Gold might be cheaper or pricier than the $5 asking price in the US, depending on where you live. In The Netherlands, it’ll set you back by as much as €16.50 ($19.75) a month, or €3 ($3.60) to upgrade from Plus. Meanwhile, Tinder Plus in India costs only Rs. 122 ($2) (Gold isn’t yet available for all users in the country). Still, a lot of folks might find that a fair price to pay to see what their prospects are in the dating pool. And it’ll likely end up earning Tinder a whole lotta coin once the feature becomes available across the globe. Do you plan to subscribe to Tinder Gold? Tell us if you think it’s fairly priced in the comments.